A conference is an arranged meeting, consultation or discussion. A conference call phone is a call wherein three or more parties interact simultaneously. Modes of communication not only include telephones, but also video and web communication. 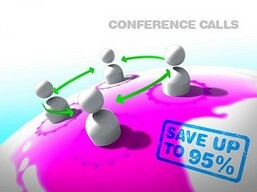 Conference calls are widely used by companies to facilitate meetings or to distribute information. It s a cost-effective way to reduce travel expenses and stay connected to one s counterparts all over the globe. There are two basic types of conferencing: MeetMe conferencing, in which each participant dials one number, and Ad Hoc conferencing, in which a moderator calls each participant. In recent times, conference calls have become very advanced and user-friendly. The conference call can be designed to allow the dialed party to talk during the call, or the call may be set up so that the called party can listen into the call but cannot speak. Conference calls connect people through a conference bridge, which is basically a server that acts like a telephone and can answer multiple calls at the same time. Companies using Voice over IP (VoIP) telephones can also host conference calls themselves if the VoIP software supports them. Businesses use conference calls the most. Banks and brokerages frequently use conference calls for the mass distribution of status reports. Conference calls are used by many businesses to facilitate communication between coworkers. Conference calls are also used to report quarterly results. Conference calls can also be used for entertainment or recreational purposes, such as the party line in which people can call in to a specified telephone number to talk to others and perhaps subsequently meet new people.